Last Sunday's win against Ballyboden secured our AHL3 team a home fixture for the playoff semi-final which is scheduled to take place on Sunday 12th at 11am in Clontarf Road. No doubt you've noticed our new Adidas gear being sported around Scoil over the past week or two! If you're interested in getting your hands on some of this new gear, please register your interest through this link. Orders and prices are dependent on numbers. How long have you been involved in Scoil Uí Chonaill? As long as I can remember my parents had me down in the club with my hurl but I suppose officially 4. Baz, BC or Bar are probably most commonly used. ‘The Answer’ never really took off! I’m from Marino in Dublin. My parents actually met in Scoil so I was always bound to end up down here. 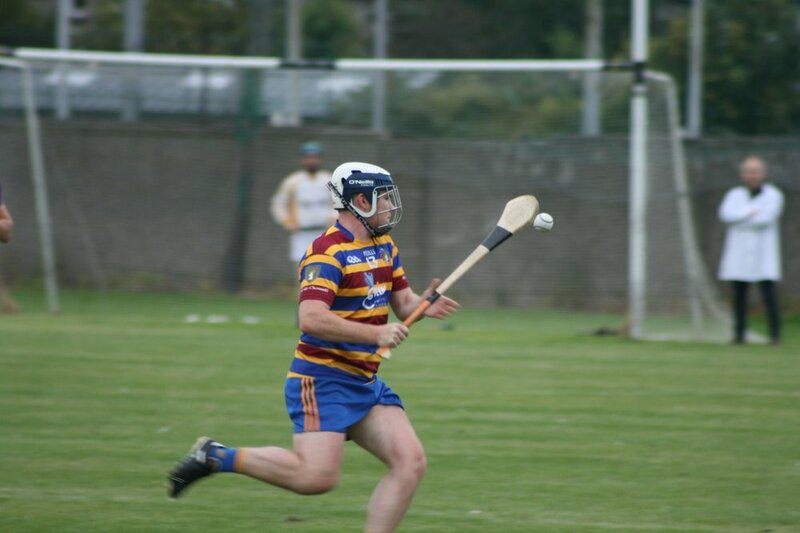 I started in the nursery at 4 years of age and progressed up through the ranks to now being a member of the Intermediate hurlers and Senior Footballers. If I’d my way it’d be for playing but realistically it’s for being Matt and Joan’s son or as a bad nursery coach! Gaining promotion in 2015 to AHL3 beating Clontarf was massive and the fact I did it with my father as manager made it all the more special. I’m a final year student in DCU studying Media Studies along with Irish. I’m a big fan of all sports in particular American Football and Basketball. I’m also a massive fan of music although the lads often slate me for my pre match music in the dressing room. It’s not original but floodlights would be incredible and maybe an astro turf training area. Also a net behind the clubhouse end goal to stop me losing sliothars. A personal favourite of mine is shaking Peter Morley’s hand every time I walk into the dressing room before training or a match. I see both adult male teams in division 1 and senior championships along with the ladies team and camogie becoming more and more prominent in the club. Finally, if you had to describe yourself as an animal, what would it be and why? Probably a giraffe or a peacock but the clueless look I give people when they explain stuff has seen me be referred to as a puppy learning to give the paw. Jack and Fahad from the Under 10s celebrated their 10th birthdays with birthday cake after their game on Saturday morning. Under 10 girls pictured after successfully defending their unbeaten record in Saturday morning's blitz. Congratulations to our GPO Thomas Gleeson who was appointed as a referee to the National Hurling Leagues. We wish him the very best of luck with this new role. The Scoil Uí Chonaill AGM will be held on Thursday 30th November in the clubhouse. The AGM financial accounts for the club will be available for inspection in the clubhouse this Thursday 9th November. The Nursery mentors are holding their annual Table Quiz on November 17th in the clubhouse at 8:00pm. The price is €10 per person with a maximum of 4 people per team. Everyone is welcome to come along to what is always a good night and help raise funds for our youngest members. It was a disappointing weekend for our Minor Hurlers as they were beaten in their Championship Shield quarter final against Naomh Olaf but sights are set on the Football League semi-final - details to be confirmed. Nursery continues, and welcomes newcomers as always. The AHL3 team won their final league match on Sunday at home to Ballyboden on a scoreline of 0:15 to 0:11. The game was played in a strong breeze and Boden had the wind in the first half. The first half game was very even and we led by 6 to 5 at the break. We started the second half well and extended our lead to three points, Boden fought back and reduced the gap to a point, we pulled away in the last 5 minutes to win by 4 points. As a result of the win, we have secured a home semi-final v Sylvesters on Sunday the 12th Nov @11. We would like to wish Joe Ryan a speedy recovery as he fractured his arm in the first half. Scorers Barry 0:9 (3 from frees), Michael 0:3, Padraig Morrissey, Padraig Kinsella & Robert 0:1 each. A great way to end an up and down season! The boys put in a tremendous performance start to finish. We played uphill on the Cornelscourt pitch ( seasoned Scoil people will know it is a big hill! )first half.The importance of staying in the game was emphasised and Scoil came in at the break 5 points up. There was great interplay from back to front throughout the half and really strong and diligent tackling and tracking. Graham was sensational in midfield and the likes of Cathal, Sean, Tundae and Brendan aided by Callum and Oisin ran the show ,ably assisted by a strong back 5 and a good, scoring frontline. Darragh and Donal fought hard for possession and got some great scores. In the second half SUC put Gers to the sword without any mercy and Ethan, Thomas, Max got great scores as did Paddy from the back.Nikhail was his usual towering self and Eoghan and Sufyian were excellent also. Liam was steady as a rock in goal and subs Conor and Borna played their part with excellent performances. It has been a hard season, some games were close run and the matches we lost heavily were questionable with respect to opposition padding their teams! A word for Caleb, Dan and Rian, three brilliant players throughout the year who unfortunately missed the game.This is a pivotal age group for the Club and the Mentors will be working hard to keep the team together and add some new players if possible. Having won all their league matches for the season, the undefeated Scoil U12 Girls team headed for an end of season blitz at Naomh Barróg last Saturday. The hosts fielded two teams, with Round Towers (L) making up the quartet. As Barrógs and Towers have traditionally proven this team’s strongest opponents, the absence of eight Scoil regulars cast some doubt over our girls’ ability to keep their unbeaten run intact. The Saturday before the Scotland trip they beat Towers in a close, tough final league match on a muddy Soil sod, while, in what are always hard fought games, this team have a three wins and two losses record against Barrógs over the past three years. Disappointingly, drawing Barrógs for both matches denied the girls a Towers rematch. Matches were 15 minutes a half, accounting for a tiring hour plus of play on the day. Providing the referees for both encounters the host club’s ethos, of not asking or giving quarter, was evidenced in the manner these two young women managed the games. They let the games flow, or go, depending on your perspective. Both games were robust affairs with the very few stoppages usually requiring the coach's magic water bottle and words of comfort. This was equally true for both teams in both matches; a few tears were shed on both sides. Famously slow starters, Scoil were sloppy in the first half of the first game conceding a soft goal early. Ball watching, weak challenges, not tracking back and loosing the shape were among the ingredients for the half time roast served by a coach who's mood had not been helped by having to cut the warm up drill for lack of focus and intent. The roast was served rare on the bone of protecting the unbeaten run in all competitions this year. It did the trick as Scoil tightened at the back, became increasingly dominant through mid-field, while the forwards found their scoring boots. In the end Scoil ran out comfortable enough victors with the half dozen or so points to spare. Having warmed up nicely now and with the coach’s post-match words (before he departed to the Girls U10 blitz in Portmarnock) ringing in their ears Scoil hit the ground running for the second game. Winning the ball from the throw-in Scoil moved it fast to the forwards resulting in a well taken goal. The resulting Barrógs kick-out was immediately returned for a Scoil point. One minute gone, Scoil up 1-1 to no score and so it went. This Barrógs selection were as strong as the first team played but Scoil simply did not let them play unhindered. While Barrógs had plenty of ball, many fine players on show and repeatedly threatened in the scoring zone, Scoil kept their shape, tracked, hassled, contested the dirty ball, defended like demons and then counter-attacked with speed, good passing and efficient finishing. In the end Barrógs only managed one point, while at 3-4 on the board, somewhere in the second half, our side-line stopped counting. This was a super day’s football from the Scoil girls : Julie, Amelia, MC, Niamh F, Pola, Liadán, Sorcha, Therese, Vana, Ray, Evie, Abbie, Heather and Emma. It was a super year by the whole team, those already named and Roisin, Zoë, Aoife, Niamh Mc, Emily, Ellie, Chaoilinn and Freja. (Apologies if I forgot anyone ☹). So Scoil Ui Chonaill U12 Ladies finish their season unbeaten in all competitions, having, in the perspicacious observation of their coach, 'dug it out’ all year long. Much credit must go to said coach, Aidan (the halftime hairdryer) Mulligan, for the achievement of this team. Honourable mention also to his 'lovely' assistants with the U10/12 squad, Gráinne, Cormac, Luke, Collie and Mark. Eight of the twenty-two girls are only playing Gaelic football for a year or so. Half of the group are U11 and of the actual U12s only three are playing Gaelic football for more than a year. This group started as an U10 team initially comprising fifteen girls from U8 - U10. In two years it has grown to a squad of thirty-five girls playing at U10 and U12, both teams unbeaten this year. Remarkable, Up Scoil! Final game of the season which all the kids were looking forward to after the Scotland adventure of last weekend. Unfortunately Monica's could only field 10 players but x4 Scoil players agreed to play for opposition to make a decent game of it. Curiously x3 of the kids were Mentors children (Alex/Adam/Luke) with Nathan making up the four. Despite the initial panic on the faces of the Scoil kids of seeing such a strong quartet playing for the opposition, they found their groove and points / goals were exchanged between the teams. Delighted Alex, Adam & Nathan were the main scorers for Monica's with Luke in goal pulling off multiple saves against his regular team mates. Overall great end to an excellent season for Scoil U10's with both Teams unbeaten in Hurling and only one loss in football. While said F/B loss for Team Jp was against Raheny, it served as the catalyst for refocusing all the kids and their over reliance on soccer - Thankfully they learnt their lesson with a number of players stepping up during the year. Overall an incredible feat for such a small panel of players. Very proud of them all, especially those who hid in the shadows early on in the season but have since shone realising they are part of a very special group of Players/Team/Club. Morning was finished off with Cake as we celebrated Fahad & Jack's 10th Birthdays! This group of girls set out their stall last Feb to carry on their 100% winning record since their inception throughout the calendar year and had managed this coming into the blitz on Saturday. We were missing 3 key girls which meant may have hindered them previously but due to the dedication of the kids ( and parents in bringing them down ) they have improved so much as a collective that we remained a strong unit. After a sluggish start in our first game the girls pulled it together and ended up winning by a goal and 4 points. In their second game they started like a steam train and played football way beyond their years and had the game over by half time which allowed us to try out different girls in different positions which was greeted with joy by the backline as they were getting cold. In their final match we rotated the team positions again and let the girls play their style of pass and move football which ended with some scores of up to 5/6 passes from backs up to the forwards and a hand passed point. They ended up winning all three games to conclude their official year of fixtures with the record intact and huge improvements made by all players. This has been especially noticeable in the level of our new girls this season as they have impressed with the speed at which they have picked up the team narrative that the collective is better than the individual and get as much enjoyment from a pass as they do a score themselves. From myself and the rest of the coaching team associated with them we want to thank the parents for their constant encouragement from the sidelines as they always come out in big numbers to cheer the girls on which is a pleasure to see. Onwards and upwards and lets see where this team can end up. The boys played their last football game of the season in a sunny Clontarf against St Peregrines. After struggling with number at the start of the season we have been able to field 2 football teams all the time and 2 hurling teams most of the time. We have ahd a couple of new additions to the team since the season started Luke, David, Rhys and a return from Isaac. Match 1 ended in a draw. Conor Meehan and Isaac were up front and combined well together to score a couple of good goals and points. At the back Cillian was in goals and made some great saves with Paddy and Conor Kelly helping out at the back but we gave a few early christmas presents to the opposition with some loose play. Quick kick outs resulted in good procession in midfield to Luke and Saoirse in the second half and some scores. Thanks to Conor Meehans granddad Bernard who helped out at half time with the team talk. Match 2 ended up in a narrow loss for Scoil despite the efforts of Blaine and Noah to outscore the opposition. Whilst we had a lot of procession the opposition turned over the ball and got some good scores. Eoghan Og, Ruairi and Jake did well at the back despite being under pressure for a lot of the game. Temi, Callum and Evan won some ball in midfield but found it hard to get it into the forwards. The lads have progressed well through the season and are continuing to learn to play as a team and skills are coming on. With kids coming from different schools and not playing together in school every day makes it a bit harder than for many other teams where kids are nearly all in the same school. Thanks to all coaches, parents and grandparents who have helped throughout the season. We will keep training and have a couple of friendlies with hopefully a road trip before Christmas. A sunny November morning was further lit up by some dazzling team scores from Scoil. Having witnessed all 3 teams score a couple of great scores where the ball was passed the full length of the pitch, it’s clear that as their first season draws to a close, the u8s are beginning to get to grips with use of space and team play. What’s more, there was some tenacious defending by some players. This physical edge is something that we have rarely seen from this bunch who have in the past been accused of being too nice for their own good! It was a morning that gave a glimpse of potential that makes you wish the season would last a little longer. Which is why it’s handy that we’ll keep going through November! For the Ambers, Oisín put in his best performance of the season, competing for everything and using his strength to his advantage. Meanwhile Paddy was very clever in his use of space, repeatedly losing his marker to win long balls that had been pumped forward. It was the way they defended as a team though, refusing to let Peregrins past, that was the most pleasing aspect. For the Maroon’s, Aibhilín played through the pain barrier after her recent school ground ankle twist. Seán grew as the morning went on and in particular played some sublime passes into his forward line when he looked up to see what was on. The team was superb in attack, but at times their tackling didn’t match their forward adventure so that’s something to work on.. Finally for the Blues, Brandon, on his debut, was phenomenal in defence. He couldn’t have possibly tried any harder and he repeatedly blocked and stripped ball from opposing forwards. Cody similarly fought hard in defence while Abigail used the ball cleverly and was always involved in her teams best passing moves. As we head into the final few weeks of Scoil Nursery for 2017, we are continuing at full speed and are planning to make the most of the time remaining. This Saturday the 11th, we will have our 'graduation ceremony' to mark on departure of our girls and boys who were born in 2010 to the ranks of league football in 2018. We hope everyone can make it and join us in the club house for the ceremony. We will also be presenting footballs which were kindly presented to us by Supervalu Killester to all our nursery members. We hope everyone can make it and join us in the club house for the ceremony. We also are reminding everyone to please make sure that they have completed their registration as this covers your child's insurance and club membership. If you have any questions on membership, please ask Aideen or any of the coaches.